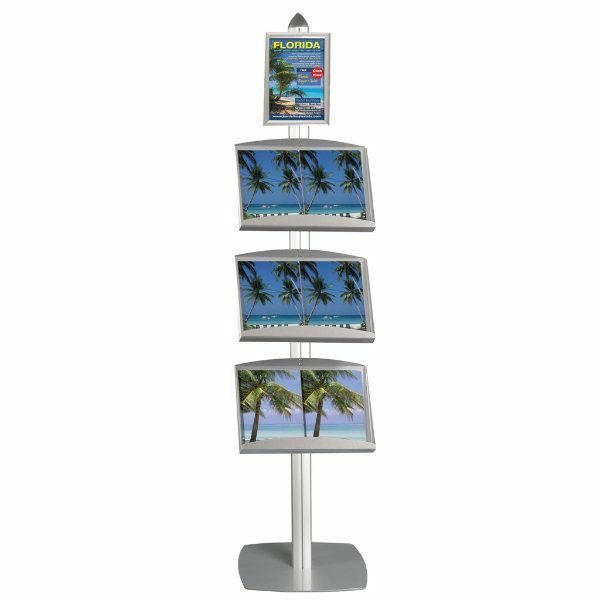 Free Standing Displays Stand with 1 * 8.5″ x 11″ Poster Size Snap frames and 3 * 2x 8.5″x11″ Steel Shelves Single Sided. Each part is Silver. Profile thickness of Snap Frame is 1″. 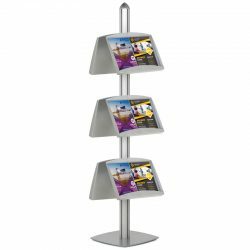 Magazine stands as also called magazine display racks are an excellent option for displaying information booklets or any other form of loose leaf literature. 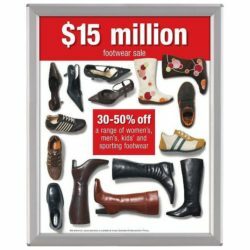 The magazine stand grabs the reader’s attention and offers customers direct access to product information and other literature sources that can be removed from the display stand either for purchase or general reading. The impressive dimensions of the single sided magazine stand (with over 75″ height) mean the contents of the magazine display rack is visible to all clients, even when positioned in a setting experiencing high levels of traffic. The almost 73″ pole of the magazine stand is complemented by three 2 x 8.5″ x 11″ silver powder coated, steel shelves that act as literature trays for the display of removable leaflets/booklets/magazines, as well as one 8.5″ x 11″ poster size silver, snap open frame. 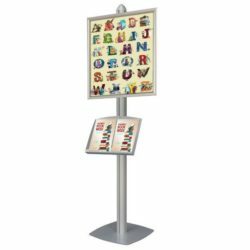 One of the greatest features of the magazine stand (otherwise referred to as a literature display stand), is the flexibility of the steel shelves. The height of the shelves can be adjusted simply by sliding the trays along the central pole, and using the connectors provided to anchor the shelves into place. To offer the most ergonomic presentation of magazines and booklets, the shelves of the literature display stands have been designed to hold all printed materials at a 25¡ angle. In addition to prioritising aesthetics, the magazine stand display offers durability and quality craftsmanship, comprising a heavy duty base and solid steel frame that will support all graphics flawlessly. 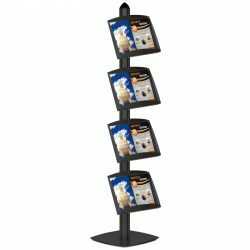 The literature display, standing magazine rack is appropriate for all commercial needs, however, the compact nature of the magazine stand makes it particularly beneficial for those short of floor space. Also see this literature display in Black! It’s perfect to keep up to date magazines. Very happy.